Whether you work in downstream, mid-stream or upstream industries, this latest version is sure to have something for you. If you are working with distribution networks, make sure to check out our new pipeline visualization module. Complex flow assurance studies are only a few clicks away in both steady state and dynamics. The VMGSim Dynamics engine brings powerful improvements to its internal technology, such as a multi-rate integrator and a feature to "accelerate to steady state". Allow your multi-core processor to crunch the numbers while you study any process, from a flaring or pigging scenario to an NGL production plant. Everything you need is inside the same simulator. - Module to inspect profiles of "pipeline paths" by allowing users to select a list of connected pipelines and inspect the main variables in a single Description. - Added a tab to the Flowsheet form called "Convergence Description" - this tab contains graphical representation of the convergence of controllers and recycles. VMGSim is a true Gibbs-based simulator that is capable of monitoring each variable's state and its thermodynamic significance. By means of the Gibbs phase rule, with enough degrees of freedom fulfilled, calculations are automatically completed and the results transmitted throughout your flowsheet. Simulations are automatically recalculated every time you change the value of a variable without the need for special estimates. 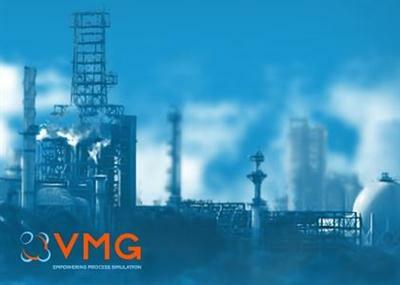 You can now concentrate on understanding your process while VMGSim handles the math. Our offices are in Calgary, Houston, Barcelona, Tokyo, Beijing, Kuwait, Sao Paulo, Auckland, Cairo, Moscow, Seoul and Mexico City. Our clients include some of the world's largest oil and gas producers as well as a wide variety of small, medium, and large size exploration, engineering, and hydrocarbon transportation companies in the world.